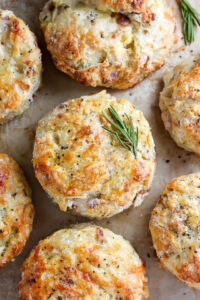 White cheddar cheese, crispy bacon, and apple make these buttery biscuits irresistible! Perfect for breakfast or as a side at dinner. 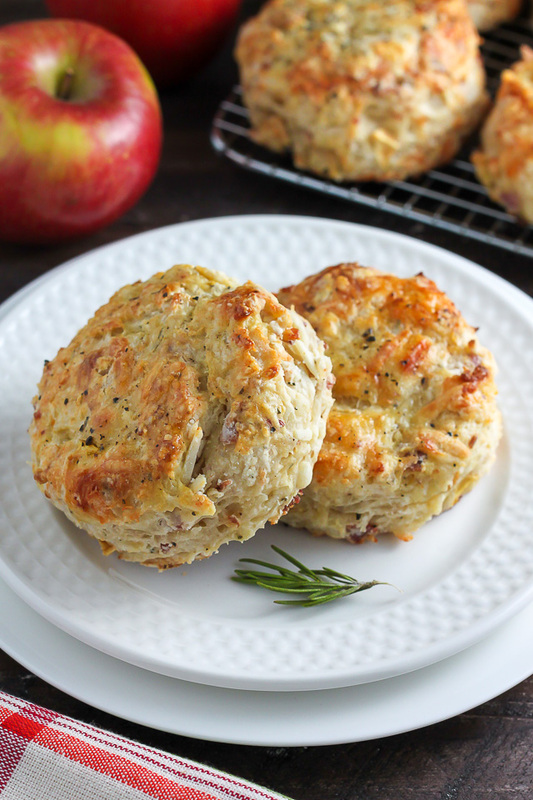 Everyone loves these savory apple biscuits! Call me crazy, but I’ve never been big on breakfast. I should clarify. What I mean is, given the choice, I always prefer non-breakfast foods over more traditional morning meals. Today’s savory biscuit recipe is inspired by the upcoming season of Fall. I know, I know. “BUT IT’S ONLY AUGUST” you say (or scream if you’re a teacher like my mom and know each day is taking you closer and closer to the first day of school). I hear you. I’m not rushing Summer out. In fact, I’m holding on to it just as tightly. But since the seasonal shift from hot and sticky, to cool and crisp is inevitable, I thought you might like to be prepared with flaky, buttery, super loaded biscuits. Edible silver linings is what the good life is all about. Let’s talk ingredients! The basic ingredients you’ll need to make these biscuits are flour, baking powder, sugar, salt, black pepper, rosemary, butter, and cream. It’s very important the butter is niiiiice and cold before adding it to the flour. TIP: I like to place my stick of butter in the freezer for 20 minutes, then use a cheese grater to quickly shred it straight into the mix. If you don’t own a grater, simply cut the butter into tiny cubes and work it in quickly with a pastry cutter (or two forks). Now. I’ve said this before and I’ll say it again, making good biscuits requires one thing you cannot find on shelves or in stores: Patience. When it comes time to cut out the biscuits you can use a traditional cutter if you own one, or get creative and use a large rimmed glass. 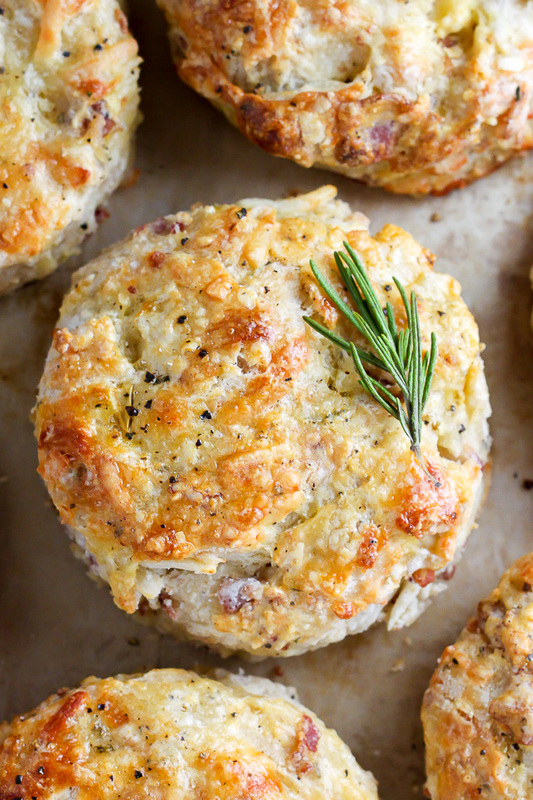 These biscuits are a breakfast lovers dream come true. 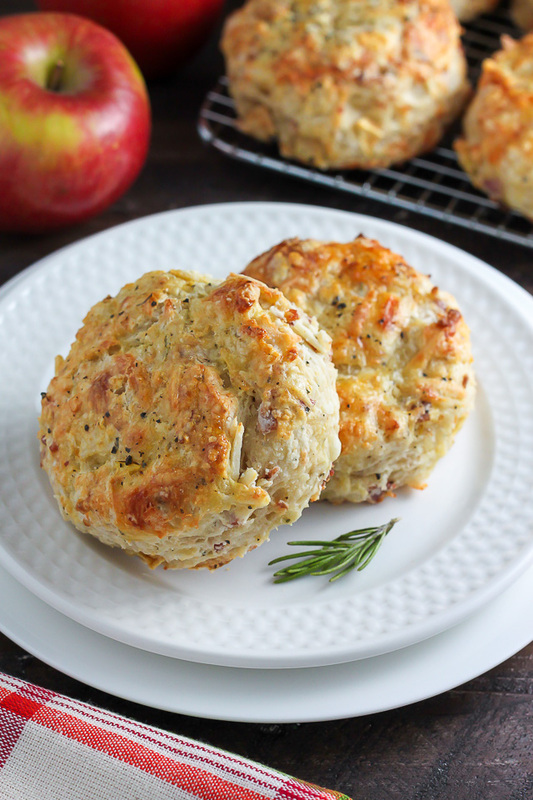 Buttery biscuits, crispy bacon, a pop of fresh rosemary and black pepper, apples, and white cheddar cheese. Ridiculously good!!! P.S. 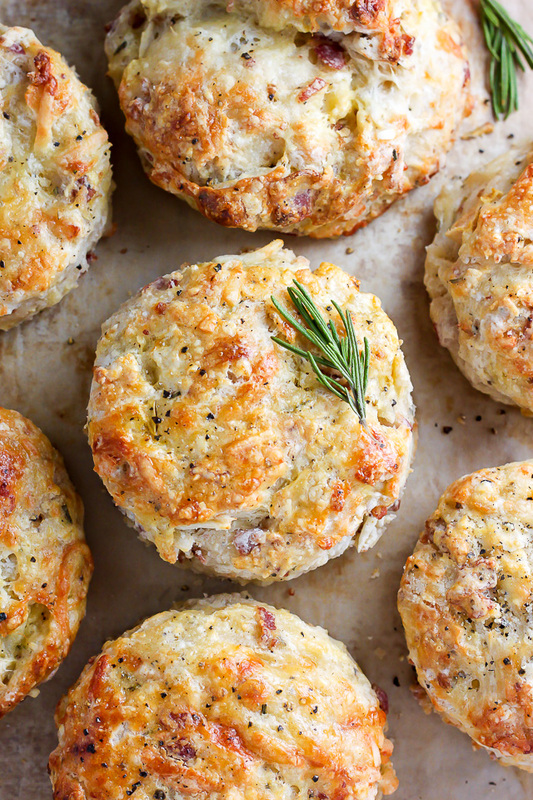 I think these biscuits will be a fabulous side dish come the… HOLIDAYS. Yes, I really just went there. Love you guys and see you soon! Nothing beats the smell of homemade biscuits baking up in the oven! 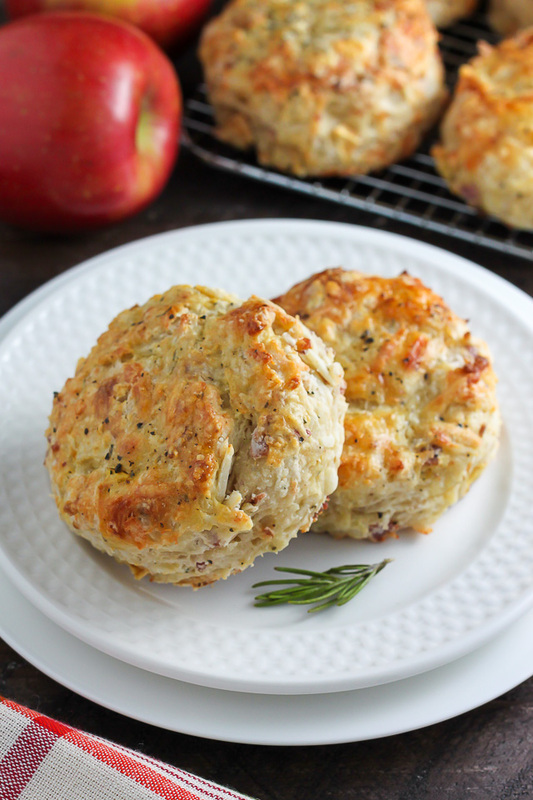 These White Cheddar, Bacon, and Apple Biscuits are sure to become a new favorite. Preheat oven to 400 degrees (F). Line a large baking sheet with a piece of parchment paper; set aside. In a large bowl combine the flour, baking powder, sugar, salt, and black pepper; whisk well to combine. 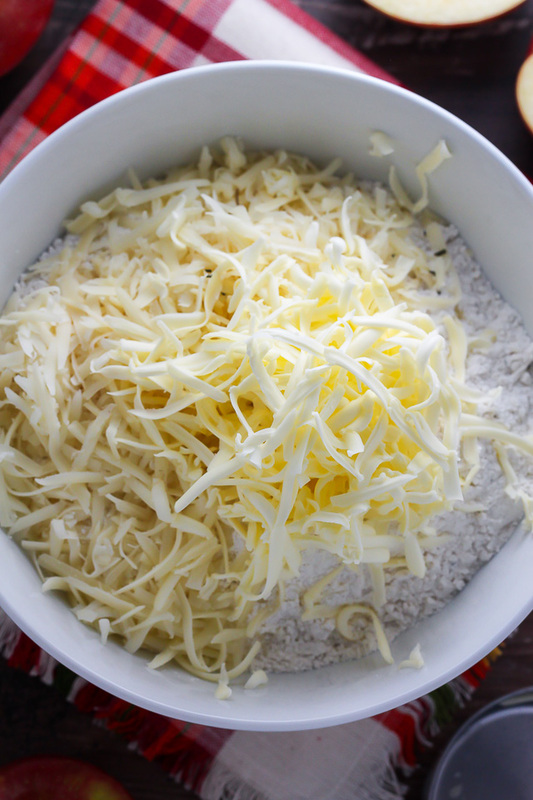 Using a large cheese grater shred the butter into the dry ingredients; use two forks or a pastry cutter to work the butter into the mix, stopping when the mixture is a coarse meal. 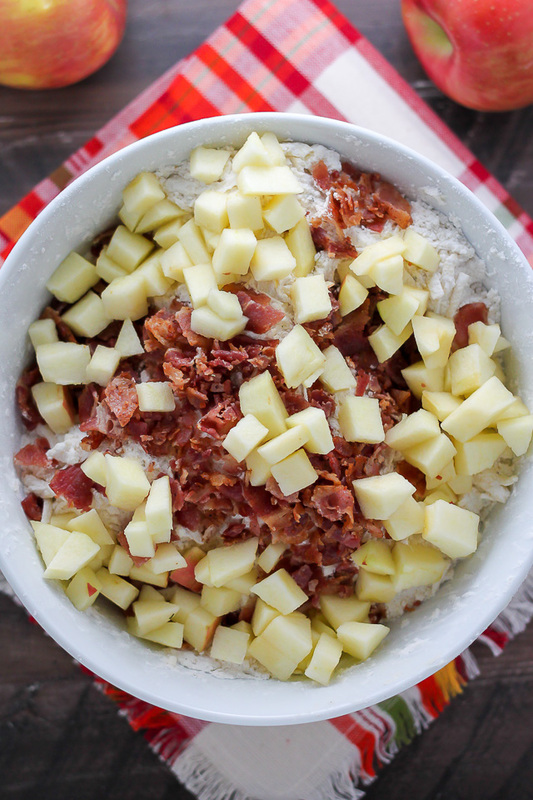 Stir in the rosemary, then add in the chopped apple, grated cheese, crumbled bacon and 1 cup + 3 tablespoons of the cream; stir with a fork just until a messy (sticky) ball is formed. Turn the dough out onto a generously floured surface and knead (with floured hands) until the dough has been worked into a ball; about 6-7 times should do it. Pat the ball down into a 1" thick round, then use a biscuit cutter to cut out as many rounds as possible, re-rolling the scraps as needed. Place the biscuits on the prepared baking sheet, brush each one with a little of the remaining cream, and bake for 18-20 minutes, or until golden brown. Eat at once! These make excellent breakfast sandwiches. I am seriously in love with the cheddar and apple combo. I have made biscuits with cheddar and apple, and they were so good. But the addition of bacon? Amazing! I need to make biscuits more often! These look incredible! I am going to make these later today. I don’t have fresh rosemary so I will be using dried. I’m thinking of maybe 2 Tbsp. Would that be enough or to much or to little? Thanks in advance. Hi Debs. Dried rosemary has a much more concentrated flavor, so I would use less. Honestly I have never tried making them with dried, so I can’t give you an accurate description on how it will affect the flavor. Please let me know how they turn out! Hi! These look amazing- saw them on IG. I just tried making them, but substituted almond milk for the heavy cream since I didn’t have. The dough ended up being super sticky – I couldn’t pat it out, even after adding over 1/2c more flour. So I ended up doing them as a drop biscuit and they were still tasty-just not as pretty 🙂 do you think it’s because the almond milk isn’t as thick? Have you tried freezing these before baking? Do you think it would be best to bake them first because of the water content in the apples? Can I make the dough a day before and bake the next day? I just made these the day before. I prepared the dough and cut them into biscuits, put them on the pan I planned to bake them on with parchment paper. Got up the next morning and baked them for a bible study. They were fantastic! This is now a favorite sight for me to get baking recipes from. I had to bake these an extra 15 min because they weren’t all the way cooked after 20. Thoughts? Batter was too wet?? Hi Chantal. Ovens all run a little differently, so cook time can vary a little. I hope you enjoyed them once they were done baking! 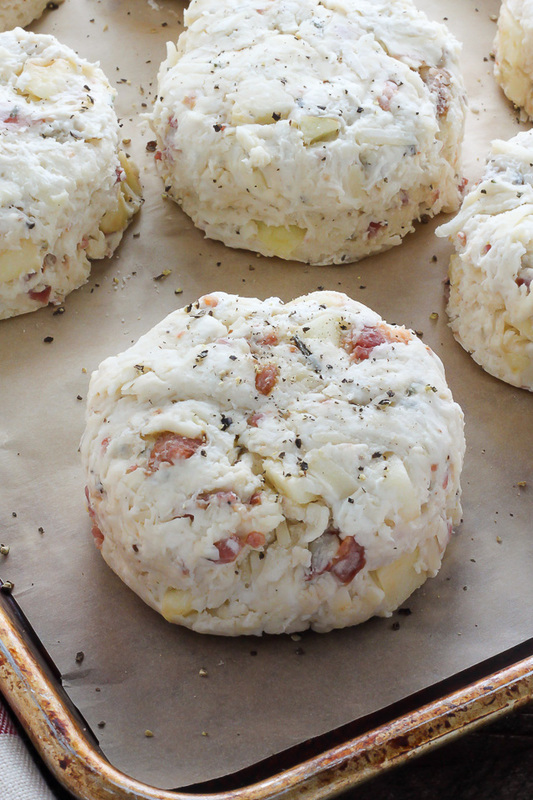 These were FABULOUS–I patted the dough into a one-inch thick circle and cut into 8 wedges. Best savory scone, ever! I will make these often! These look delicious! I want to bring them as snacks on a roadtrip, do you think they will still be ok even if not eaten right away? Will they keep ok after a night in the fridge? What are items you use when making breakfast sandwiches with these biscuits? In one of my batches, I substituted dried cranberry for apple and it turned out really good. I made this biscuits today they were amazing . Thank you so much for sharing the recipe. These sound heavenly! Would it be possible to substitute almond flour? Hi Ellen. Thank you! Unfortunately I don’t think almond flour would work. HI, I’ve made the biscuits yesterday and they were a hit! I love your recipe! I’ll be doing your biscuits for as long as I can cool LOL. Thanks for shearing! Hands down the BEST biscuit I have ever had and Trust me. I love eating and baking biscuits. Amazing.